BOO Blocks! 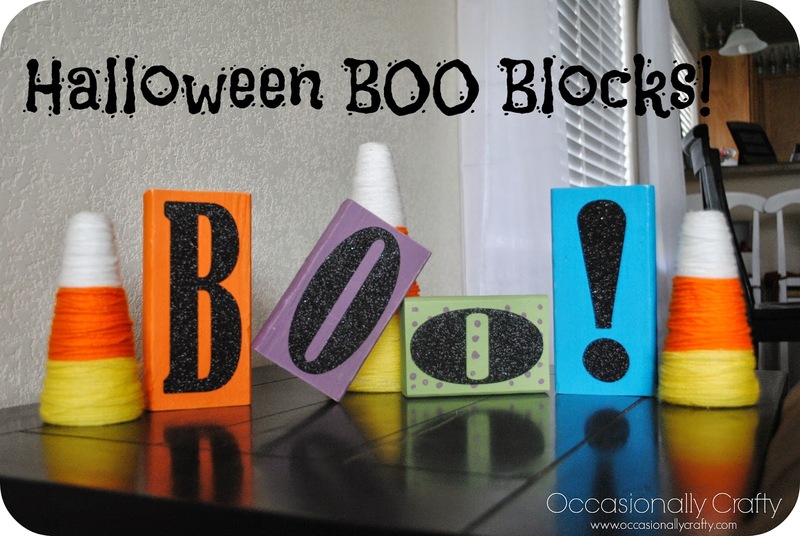 | Occasionally Crafty: BOO Blocks! Last year I was over at a friend's house when I noticed a really cute Halloween decoration. I snapped a picture on my phone and kept it prisoner there for almost a year before I decided to recreate it for our house! I really had to get up the nerve to do this because I'm not very good with wood crafting yet. Luckily we had some wood in our garage, and it turns out we had a jigsaw that just needed a blade! So I put my big girl pants on and used power tools! I have to admit, it was pretty empowering to do it myself and not have anyone make the cuts for me. Absolutely love and adore these.. They came out perfect~! Thanks Aimee! It adds a lot of color and fun to my decorations! Another great and easy idea! Thanks you so much. Going to make those with my kids this weekend. These are really cute, and easy to store since they're not huge. Good job. I hadn't thought about storage yet, but you're right. They're a nice sturdy project I won't have to worry about mashing up in a box! Love it when people get creative and think outside of the box, especially for Halloween! Thanks for sharing! I just love how the yarn looks like candy corn! How creative and so cute!